Sprawled across the north-west corner of County Clare is a bleak landscape of stone, water and sky. Open moorland stretches to long horizons. Wild flowers bloom between sheets of scarred karst limestone. Black turlough lakes pool at the feet of brooding hills. 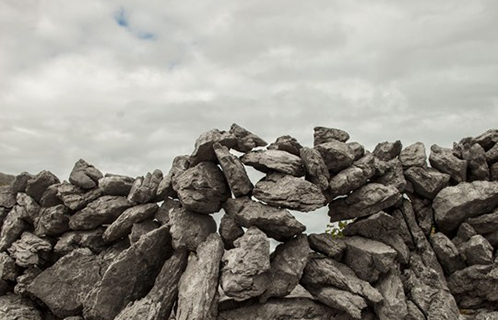 Swept by Atlantic gales, the Burren is made for castles. Prehistoric ring forts and medieval towers appear like natural outcrops, the guardians of this harshly beautiful country. 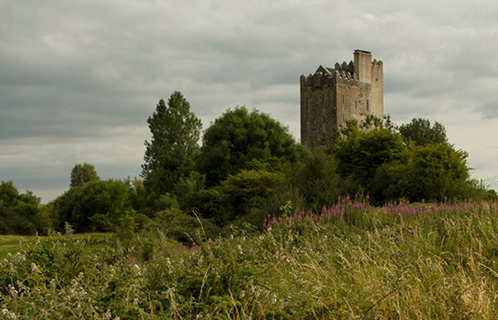 Ballyportry is one of the most impressive, a tower house built in the 15th century for the O'Brien family, descendants of Brian Boru, the High King of Ireland. We think of these western regions of Ireland as being remote and parochial. But in medieval times, when the sea was more reliable than the land for travellers, areas like the Burren would have been closely connected to the continent. In its day, Ballyportry would have had a cellar of French wines, tapestries from the Low Countries, pottery and silks from Spain, books and rosaries from Rome. This was not the stronghold of a barbarian chieftain but home to an educated and sophisticated elite, the aristocrats of the Old Gaelic Order, who thrived in the days before the English arrived to wreak such havoc on Irish culture. The reconstruction of Ballyportry in the 1960s was the work of an American, Bob Brown. When Brown discovered that his vices in New York - staying up late and drinking too much - were virtues in County Clare, he decided to stay, and in a moment of madness he bought Ballyporty. Brown became a pioneer in the restoration of medieval tower houses and an inspiration to many later renovators, including Frank and Aifric Gray at Ballybur. We were welcomed by the present owners, Siobhan and Pat Wallace, who have brought an intellectual life back to the tower. Siobhan is an architect while Pat, the director of the National Museum in Dublin, is an archaeologist. A grand dinner at their long wooden table was a feast of good food and great conversation ranging from the old Gaelic Order to Ian Paisley, from the Burren's rare wild flowers to the collapse of the role of sports in Irish identity. Sophia and I set off for walks every day with local friends, visiting megalithic dolmens on bleak highlands, skirting the mysterious turloughs, searching for the rare pine martens in the woods, visiting the wind-hollowed ruins of the Cathedral at Kilfenora. One evening we sat by the peat fire in Linnane's pub entranced by airs and reels of the Kilfenora Céilí Band. Another evening, in the Great Hall at Ballyportry, I had a medieval moment. A fire was burning in a grate large enough to roast an ox. From the high windows, I gazed across wetlands and tussocky pastures where two donkeys were grazing. On the horizon was the iconic shape of Mullaghmore. The wind was sighing among the battlements. We have all trooped round castles at some point, climbed the stairs, peered into rooms from behind the velvet ropes. But at Ballyportry I had suddenly stepped over that velvet rope. 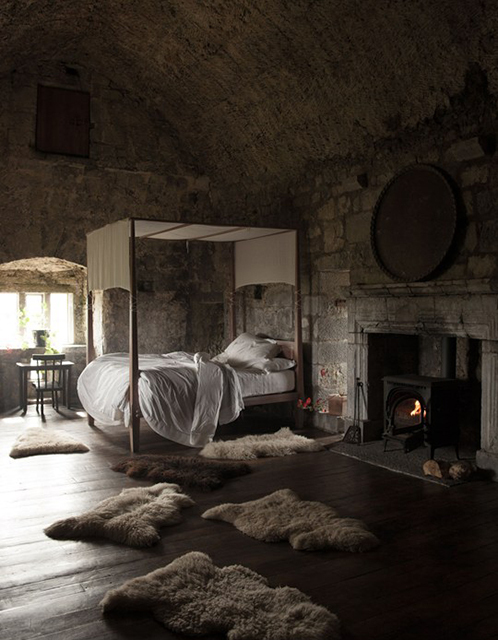 In the Great Hall, beneath the massive roof timbers, I was throwing logs on the fire, lighting candles on the iron candle stands round the stone walls, sinking into the sofa with an account of the Flight of the Earls, that seminal moment when Ireland's greatest chieftains fled the country for exile on the continent. For a moment I felt close to the people who had once lived here, who had sat by this same fireplace, listened to the same winds, in a distant age when these castles were the centre of culture and longing in Ireland. Until Sophia arrived with a request to play princesses and pirates. And then we chased one another up and down what WB Yeats used to call the 'winding, gyring, spiring treadmill of a stair'.